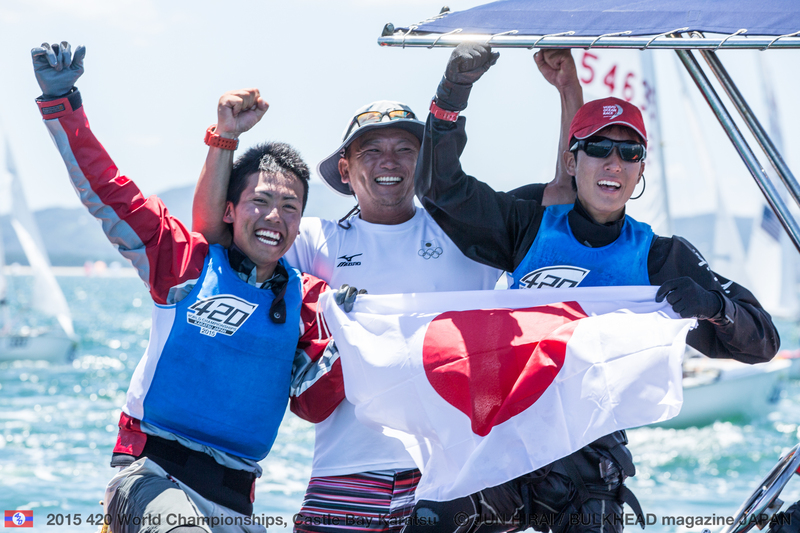 Race day 5 was a defining day here at the 420 World Championships in Japan. As the sun came out for the first time since last Saturday, the energy in the boat park also hit a high as teams prepared for a breezy penultimate day of racing. With an average 16.5 knots, gusts hitting 20-25 knots and the odd 30 knot puff channelling through the 420 Open and Ladies Gold races, the Race Committee was able to set a 1.2 mile upwind leg. Conditions eased by the time the Silver and U17 fleets took to the race track. 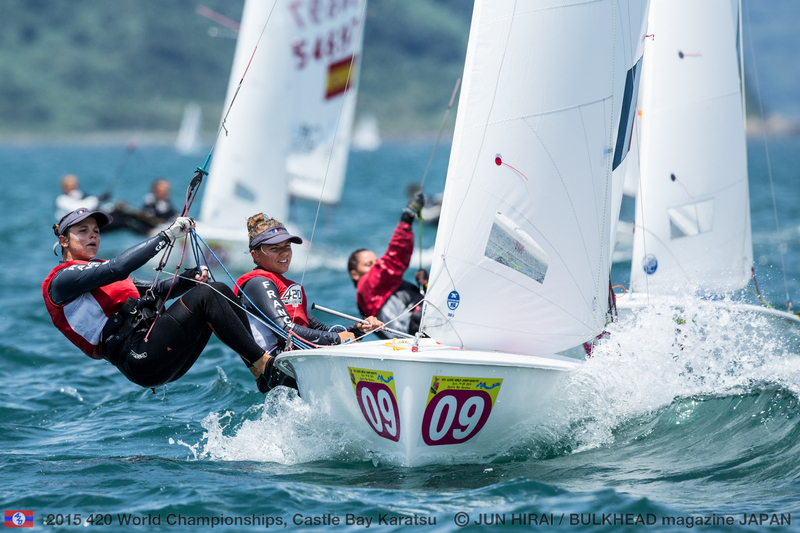 Leaderboard shuffles see Hong Kong take over the 420 Open leaderboard, whilst Spain and Italy consolidate at the front of the 420 Ladies and 420 U17 World Championship fleets. 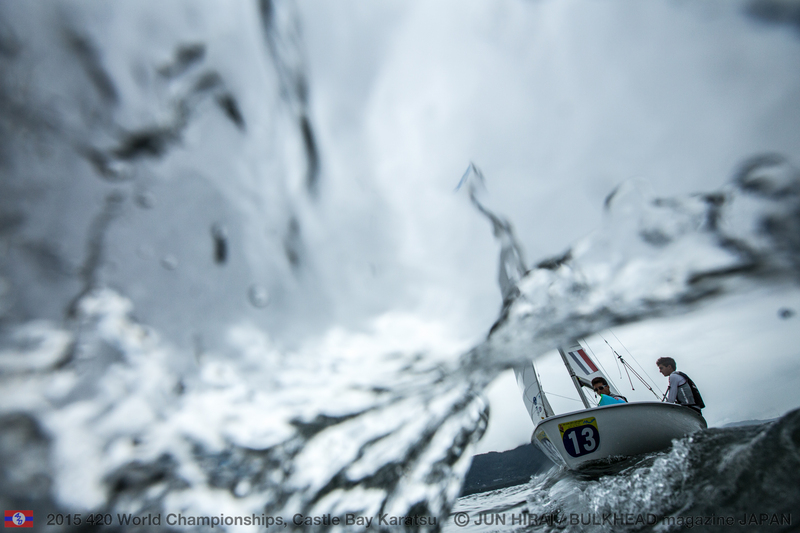 Everything is still at stake, with tomorrow’s closing two races likely to be a light wind teaser, giving lots of opportunities to switch the line-up. 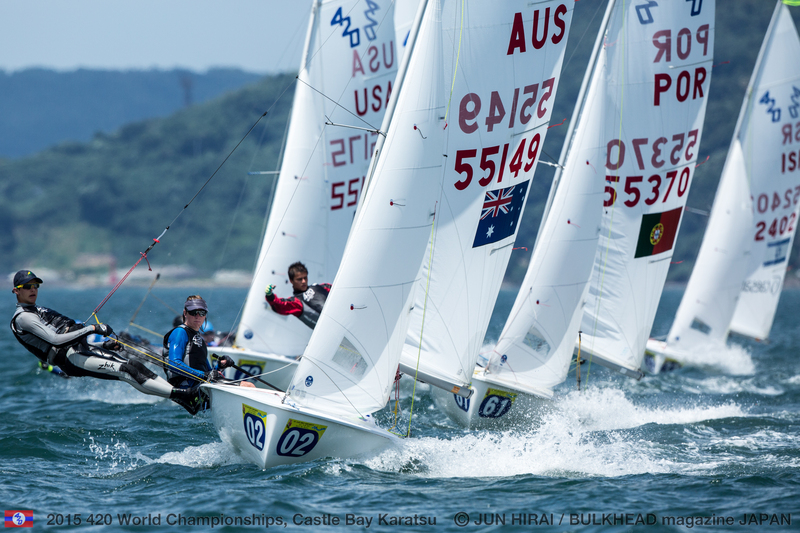 Teams representing thirteen nations currently sit inside the leaderboard top ten across the three World Championship fleets - what better showcase of the depth of talent of the world’s most popular two-person youth dinghy. 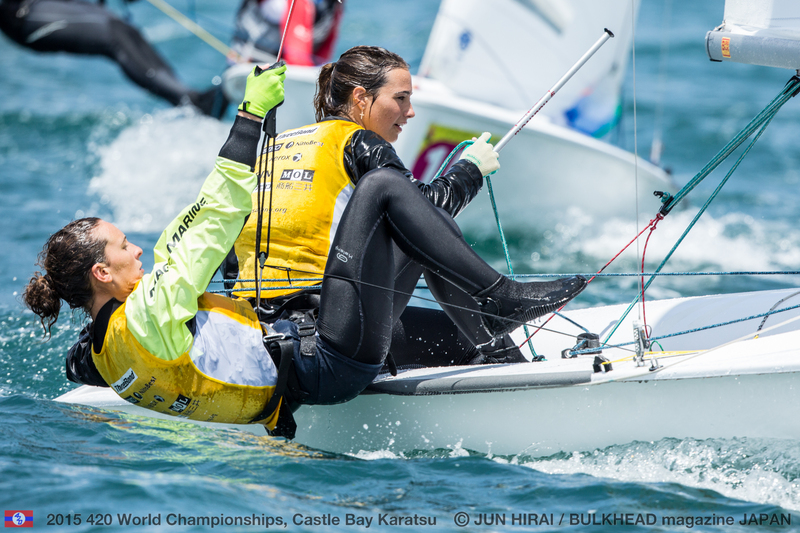 Marta Garrido/Maria Jesus Davila (ESP) hold firm in first overall, but Japan’s Misaki Tanaka/Sena Takano are eating into the Spaniards’ points lead. 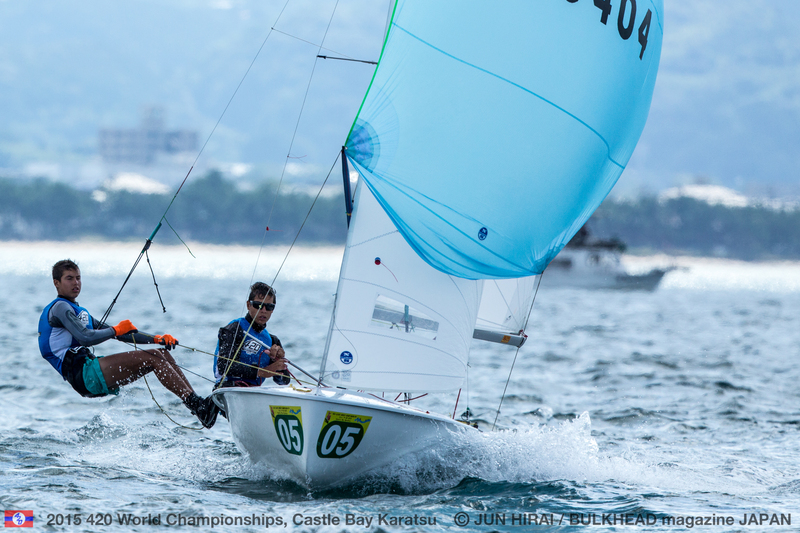 Charlotte Yven/Marine Riou (FRA) remain in third. Leaders Garrido/Davila hold an extremely useful 12 point advantage over the Japanese, and are discarding a 10th place so know they have at least one race in hand to take a risk. Win here tomorrow, and crew Davila will match her brother’s achievement when he won gold in the Open fleet at last year’s 420 Worlds. Three new teams move up into the top ten, led by Nia Jerwood/Lisa Smith of Australia who unleashed something special today to claim a 1,2 scoreline and advance to 7th overall. The partnership has all to play for here at their second 420 Worlds appearance. “We like the wind,” commented Jerwood on their escalation in performance. 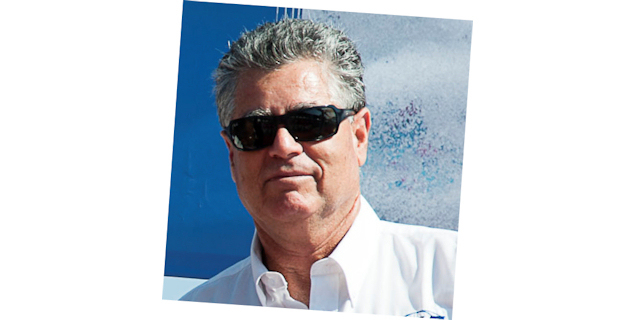 “We train out of Fremantle Sailing Club, where we get really strong sea breezes. We are used to it and we love it. 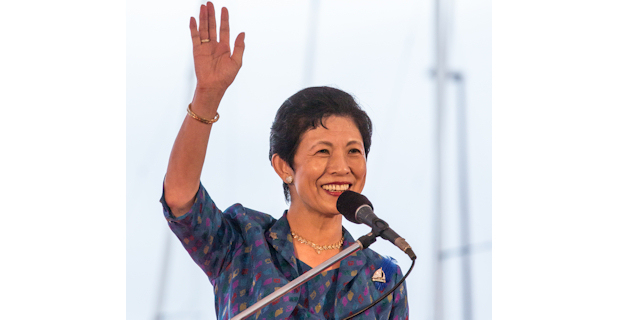 Jerwood has shown incredible resilience to even make it to Japan, after double-knee reconstruction surgery in January put her out of the boat for three months. She stepped back into her 420 in early May, but it was impossible for her to manoeuvre across the boat when tacking, so a friend would swap-in to tack, before Jerwood jumped back in. “It’s been pretty difficult, but it’s getting better,” she smiled. Sitting just 16 points off the podium places, they will need to be radical to make up the points shortfall, but this Aussie team possess the guts to deliver. Moving up to join them in the top 10 are Sofia Giondi/Giulia Gatta (ITA), Audrey Giblin/Ashton Borcherding (USA) and Theres Dahnke/Birte Winkel (GER). 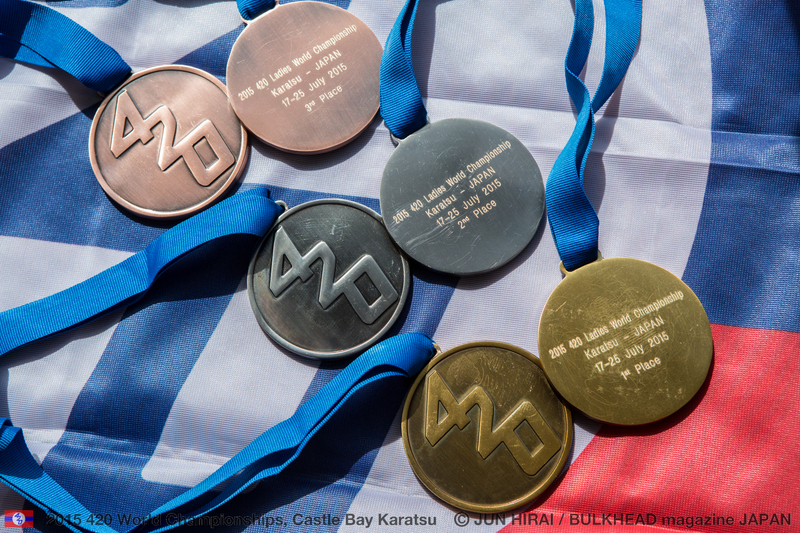 The Americans’ current placing marks the best result since the nation finished with a silver medal at the 2010 420 Ladies World Championships in Israel. Saturday’s two races will come down to some smart decision making, with the significant points difference demanding some front of fleet finishes to overthrow the current podium placed teams. 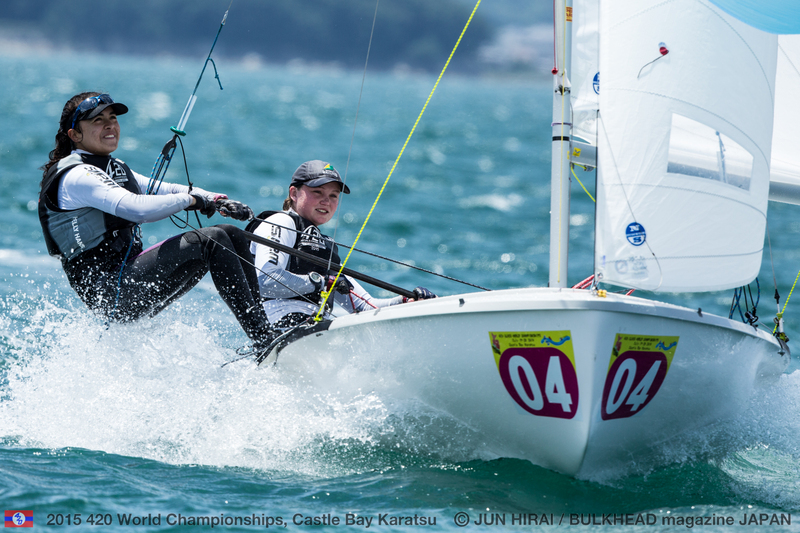 In the silver fleet, Laura Selvaggio/Maria Pastorelli (ITA) lead, Sumiko Masumoto/Saya Himeno (JPN) in 2nd and Maike Roos/Maren Roos (GER) in 3rd with just 3 points separating them. The Asian dominance today swapped hands from Japan to Hong Kong, as Calum Gregor/Hugo Christensson swept past three teams to take the lead by 2 points over Daichi Takayama/Syota Nakano. Greece’s Vasillios Gourgiotis/Epameinondas Orestis Batsis raced a solid 7,6, moving up from 10th to 3rd. Put a foot wrong though, and Takayama/Nakano are waiting to pounce. 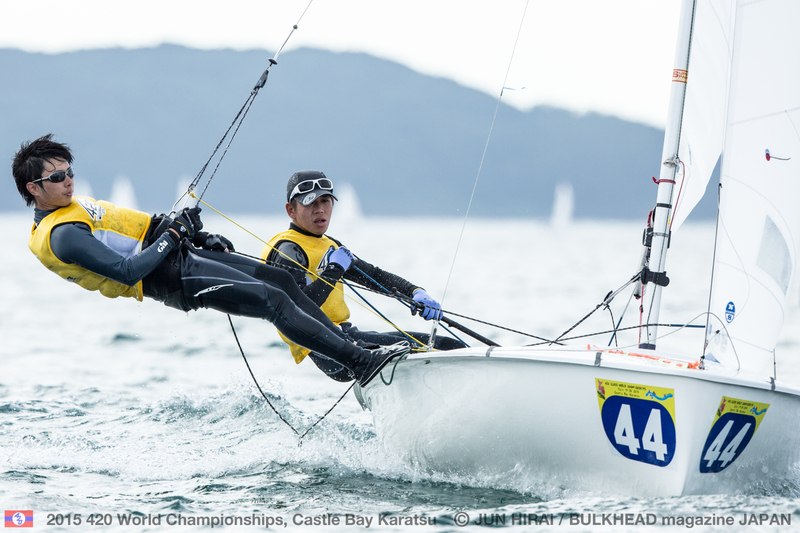 For their team mates, the increased breeze prompted the worst day of racing so far for overnight leaders Hiroaki Kato/Takuma Yoshinaga,whose 32,9 scorecard dropped them to 4th, but still well in touch with the podium places. 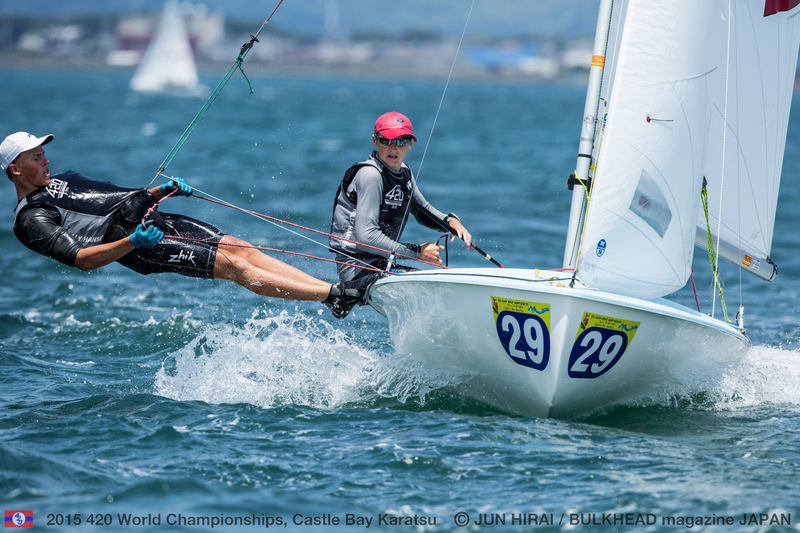 Whilst some struggled in the breeze, it favoured Argentina’s Felipe Diniz/Ivan Aranguren, reigning 420 South American Champions, who move up to 5th and are well on target to improve on their 17th place finish at last year’s 420 Worlds. 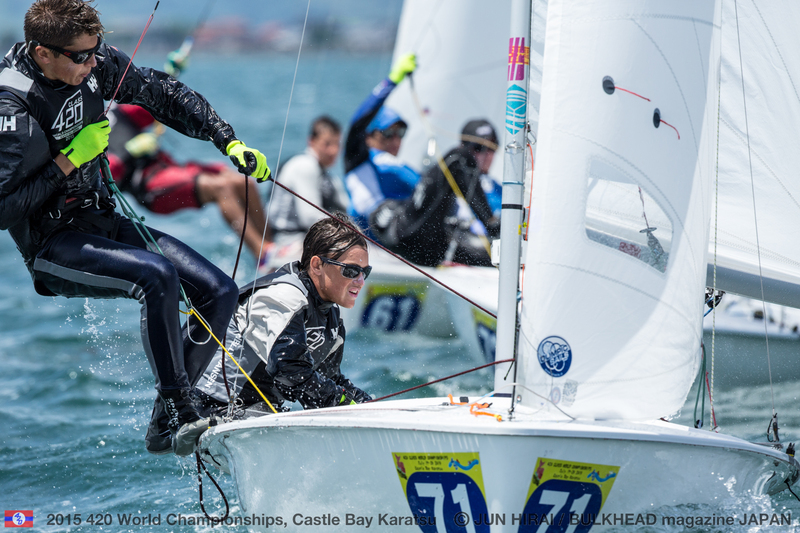 America’s 420 teams are so far putting in one of their strongest series ever at a 420 World Championship, with the three teams qualified to gold fleet racing all inside the top 20, two in top 10. 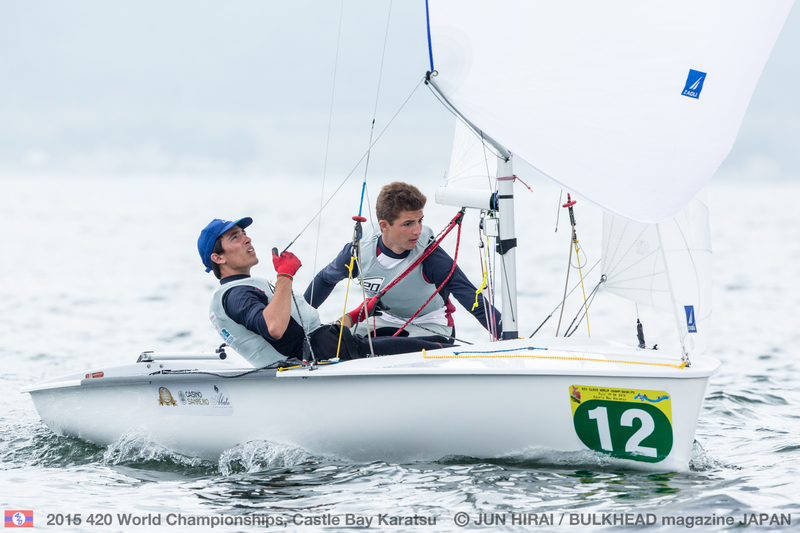 Top placed USA team, in sixth overall are Wiley Rogers/Jack Parkin who finished 2nd in the final race of today. Rogers relishes the diversity of the 420, saying, “The 420 is a planing boat, so you go pretty quick in anything from 12 knots and above. The tactics and strategy are still there when you are going fast and planing, so you can’t just focus on speed, you’ve got to really connect the puffs and play the shifts and play the wind. You have to work on your speed through the whole process. Brazil’s Pedro Correa/Philipp Essle move into the top 10, as do France’s Arnaud Herail/Paco Lepoutre. Just 28 points separate the current top 10 teams on the leaderboard, and everyone knows that anything and everything can unfold tomorrow. 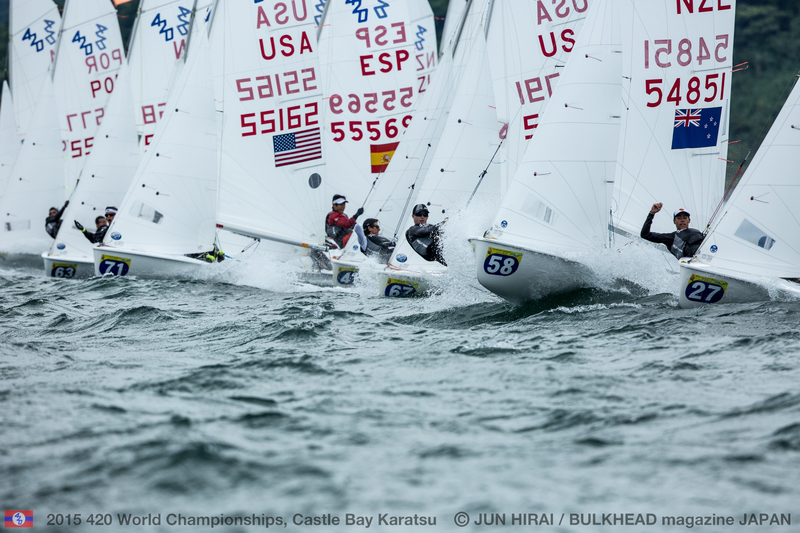 In the silver fleet the battle for glory is every bit as fierce, with Marc Lladó/Javier González of Spain leading over Italy’s Andrea Totis/Marco Zanni and Japan’s Kent Sakakibara/Taisei Sakamoto in third. 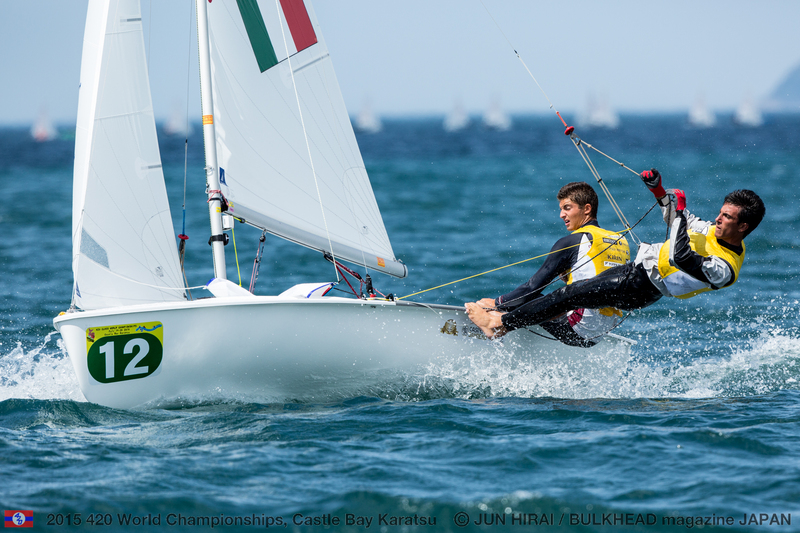 In the under-17 420 World Championship fleet, Edoardo Ferraro/Francesco Orlando (ITA) retain their pole position. Just a swap in order of the two teams behind, as Greece’s Aggelos Arvanitis/Theofanis Kanakaris (GRE) break the points tie they had at the start of the day with Spain’s Enrique Lujan/Pablo Lujan (ESP) and move to second overall, with the Greeks in third. So far, no-one has been able to displace the Italian leaders and with an 11 point advantage and counting an all top 5 scoreline, tomorrow’s outcome looks to be in their favour. The scoreboard is much closer behind, with the teams placed 2nd to 3rd sharing just a 12 point differential. A new team to break into the top 10 today are Matthew Logue/Cameron Giblin (USA) from solid 4,5 results. The first warning signal for 420 Open Gold, 420 Ladies Gold and 420 U17 is scheduled at 1030 hours. The intended starting order will be Start 1: Open Gold – outer loop, Start 2: Ladies Gold – inner loop, Start 3: U17 – inner loop. The first warning signal for 420 Ladies Silver and 420 Open is scheduled at 1230 hours. The intended starting order will be Start 1: Open Silver – outer loop, Start 2: Ladies Silver – inner loop.